Just Another Day is an EP that explores the Western world. 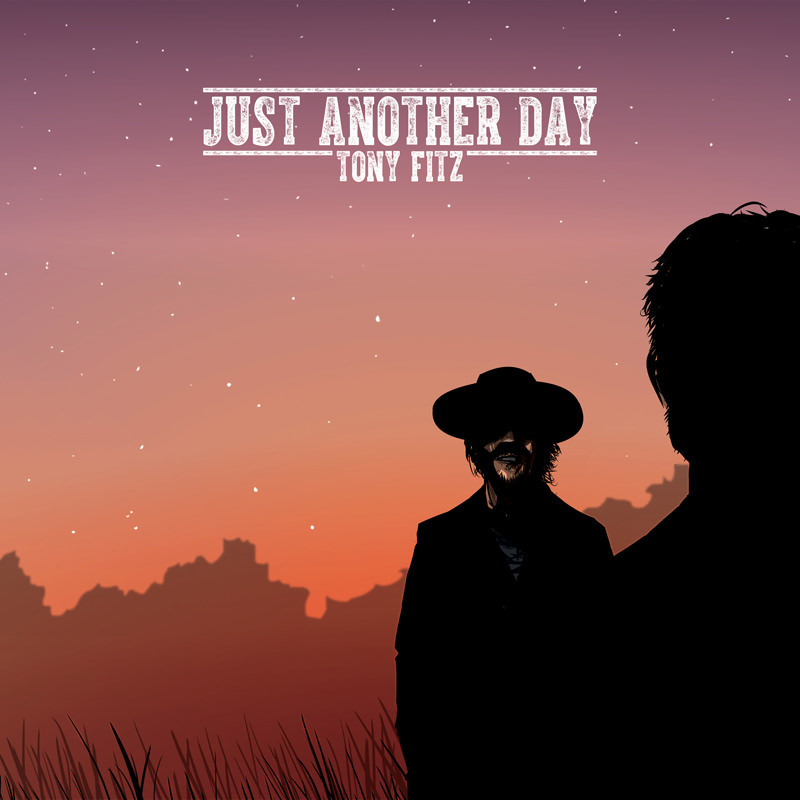 Through the medium of music, five songs and chilling vocals, the artist Tony Fitz tells the tale of two men, their hardships and the untimely deaths of many. The EP is accompanied by a comic book that illustrates the events taking place in the lyrics of the songs – this artwork was created by award-wining Irish artist Tommie Kelly. The EP outlines its Western theme immediately as the opening song ‘The Murder’ kicks off with the twang of a guitar, followed by the sound of clapping hands. It is within this song that the story begins and where I found myself becoming intrigued as the tale itself began to unfold. ‘The Murder’ is also quite catchy and I found myself humming along to the series of ‘Ooohhhs’ that feature within the song. Lyrically and vocally the EP is almost unfaultable and pleasing to the ears, making it easy to listen too. One of my favourite songs of the five tracks available is ‘Digging’ – track 2. The song explores love, family and loss within a 3 minute span. It stood out for me personally as it came across rich in emotion and felt genuine. The song is written in a manner that suggests the artist, Tony Fitz truly imagined himself in the position of his character. What is intriguing about this EP is the story element, each track holds vital information that one needs in order to reveal the tales ending. The story peaks in intensity at track 3 –‘The Shootout’- as “there’s a stranger waiting outside” and it is within track 4 –’19 years ago’ that the listener (Well I was anyway) is engulfed by the lyrics as “he swore he would return it to the man that used to call it his” and as the final track – ‘Just Another Day’ began, I found myself anticipating the ending – just to see how these men faired out. In regards to sound it is not a ‘new sound’ and when listening to the EP, I felt as if I have heard similar music to it before – which is to be expected as it’s common to find similarities between a number of EPs/albums. Upon listening to the EP, I often found myself being reminded of the Counting Crows. However, in saying that, the tracks that were produced have been completed to a high standard. It is because of this combined with the marvellous storytelling and the engaging artwork that I would recommend ‘Just Another Day’. It is officially realised on the 12th of September and is available for pre order here. I have to admit, I did not know who Tony Fitz was before this review was presented to me. I was unaware of his presences within the Irish music scene and because of this, I found myself asking ‘Who is Tony Fitz?’ – Well it is said that you will more than likely find him behind the sound desk at Homebeat events. He is a talented musician and producer from Kildare and has worked with some of the most exciting acts within Ireland, recording and mixing live videos featuring: Bantum, Carriages, Biggles Flys Again and many more. Homebeat will present the ‘Just Another Day’ EP launch party on the 12th of September 2014. The event will take place in Filmbase, Templebar and will present live visuals by Le Tissier, support from @ventures and a DJ set by Bantum. The tickets are on sale from €8 and can be purchased here. However before the launch party Tony Fitz will be playing Another Love Story on 23rd of August and Electric Picnic on the 29th of August. I would highly recommend following Tony Fitz on both Facebook and Twitter, whilst also keeping an eye on his Website, as I feel that there is much more to come from this talented young artist.